"This is the San Francisco America pretends does not exist," the writer James Baldwin said while surveying the historically black Bayview-Hunters Point neighborhood in 1963. That quote, from the documentary Take This Hammer, offers a glimpse of a neighborhood literally and figuratively on the margins, isolated by forceful police, poverty, and discrimination. African Americans had come to the south-easternmost tip of San Francisco seeking jobs, as the Chronicle recently recalled: During WWII, the US Navy bought an existing shipyard in the area where, until then, slaughterhouses and fisheries were among the only landmarks. The navy was offering to hire workers from across the nation, and many African Americans from the south, which was deeply divided under Jim Crow, made the trek to seek better employment, living in quickly-built homes and dormitories. After the war, however, jobs became scarce. Living quarters deteriorated. Three years after Baldwin's remarks, on September 27th, 1966 — exactly 50 years ago next week — police in the neighborhood shot and killed a fleeing, unarmed 17-year-old black child, Matthew Johnson, who was sometimes called "Peanut" by his friends. Johnson and two friends had stolen a car for a joyride, though the officer who shot and killed Johnson couldn't have known that, because the car hadn't yet been reported stolen. Still, when stopped by police, the three young men fled, and the officer ended up chasing Johnson, firing at his back and killing him. An angry, grieving crowd formed around the naval yard, demanding that the officer who killed Johnson be charged with murder (he appears to have merely been suspended). Meanwhile the city's sole black Supervisor at the time, the NAACP and civil rights defense attorney Terry Francois, was insulted and assaulted near the Bayview Community Center. What followed that night were events sometimes termed "riots" or "rebellion." Whatever they were, they prompted an intense reaction — or overreaction — from city police and government, with the National Guard and Highway Patrol called in to the neighborhood. As the history website FoundSF writes of the scene: "Perhaps the best indication of both the essentially passive character of the response of black males in Hunters Point and the unreasonable magnitude of white fears is the fact that, aside from long-range brick throwing, less than a half dozen assaults by blacks against whites were recorded in the course of five days of rioting." One harrowing example of that appears in The Movement, a newspaper published by he Student Nonviolent Coordinating Committee (SNCC). They wrote in an October 1966 issue that, after the arrival of the National Guard, cops had opened fired into a community center full of sheltering children whom they believed to be armed. But when the children escaped, police reportedly entered the building looking for weapons, of which there were none. Tensions ran high for several days. An untold number of black neighborhood residents were arrested, and all were essentially penned in, unable to leave the area. But by October 1, the "riots" were over, and the police and the National Guard presence was pulled. The significance, 50 years later, of the events — most notably the murder of 17-year-old Matthew "Peanut" Johnson — should need no elucidation. Instead, they are events that demand further consideration. For more, a documentary called Bay View Hunterss Point: San Francisco's Last Black Neighborhood? 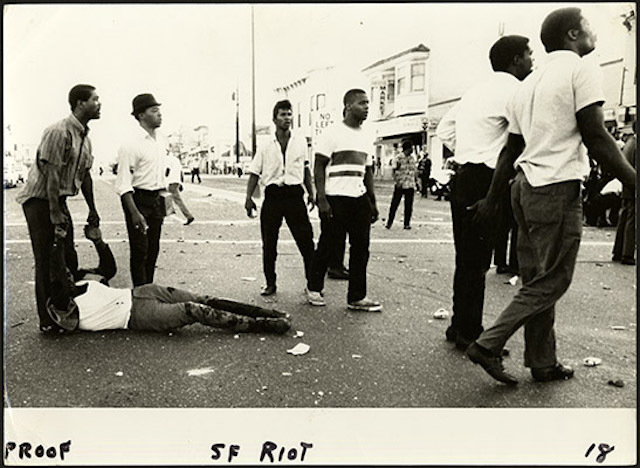 has some archival footage of the Hunters Point Uprising, and FoundSF also has two interviews with locals who lived through the events: Darrell Rogers and Thomas Fleming. Last, the entirety of Take This Hammer is available here, on Vimeo.